How to file a Belated Income Tax Return ? What is Belated Return [Sec 139(4)] ? Any person who has not furnished a return within the time allowed to him u/s 139(1) may furnish the return for any previous year at any time before the end of relevant assessment year (for example belated return for FY 17-18 should be filed on or before 31st March 2019). With EZTax Belated self service tax efiling, you no longer need to deal with another professional in filing your taxes. 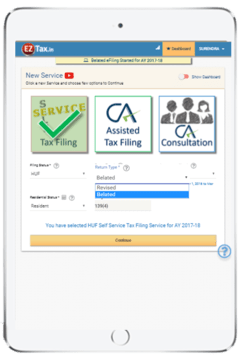 EZTax is the 1st Belated Tax Filings and only software available pan India to provide step – by – step guidance through EZHelp in making your filing an experience. Whether it is a deduction and/or exemption, look no further in getting the advice you need on the screen. You no longer need to search the blogs to get to know the limits, or tax know how Belated Filings. Yet, it's FREE. No longer needed to search your tax documents for your Foreign Visa and/or for a home loan application. 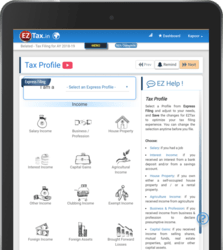 Tax files are available 24X7 with EZTax Belated Filings. We are by far the fastest e-Filer With Belated Tax Filings in the market today in India. Once prepared, takes just a few seconds to upload your return! AY 2017-18 and AY 2018-19 questionnaires are available now for you to use! 1.When is the Income Tax Filing (ITR) Deadline? Typically, it’s Jul31st of every year but may vary based on Govt Decisions, Eg. for AY 2018-19 it was Aug 31st, 2017. 2.What if you miss the deadline for filing income tax returns? No Worry, you can file your taxes using belated return type up to Mar 31st, 2019. 3.What are different Return Types to choose while filing Income Tax Return (ITR)? Original: Income Tax Return to be filed for the first time on or before due date for the selected Assessment Year. Belated: Income Tax Return to be filed for the first time after due date. Revised: Income Tax Return to be filed in response to a notice or a defective original return. Revised return can’t be filed in case of a belated return, which is filed for the same Assessment Year. 4.Do you have to pay Penalty? Yes. Unfortunately the penalty for filing Income Tax Return after the due date is applicable from AY 2018-19. The Government of India (GOI) Feb 2017 introduced a maximum late fee of Rs. 10,000 for delayed ITR filing by individuals. 5.What if there is an error in my ITR? You can file a Revised Return for the Original before the end of the current assessment year i.e., before Mar 31st, 2018. 6.What about Aadhaar PAN Linking? Deadline for linking Aadhaar, PAN cards, a must for filing ITR, is Aug 31st 2017. Without it your ITR won’t be accepted. There are few exceptions to this such as those who are senior Citizens (Age > 80 years) OR who are residing in the States of Assam, Jammu and Kashmir and Meghalaya OR a non-resident as per the Income-tax Act, 1961; OR not a citizen of India.